This is the first step. The stand process would be to print a purchase order. 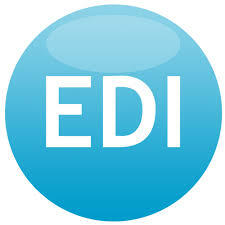 In the case of an EDI system, an electronic file will be created which can be used to build an EDI document. There are many potential sources of this data including a screen where an operator enters the details. The most efficient and accurate would be an automated system which generates orders on demand. Now the electronic file is converted into the standard EDI format using translation software. Since the point of EDI is to be able to talk to different systems, it is important that the data mapping is done accurately. Alternatively, there are EDI service providers who can do the translation. Now that the document is translated, the next step is to transmit this to the business partner. There are couple of ways to do this. The first is to send it through the internet using a secure protocol like AS2. The other is to use an EDI provider. Once this is done the process will reversed at the other end. In the case of a shipping order, you will get a ucc128 shipping confirmation in return.